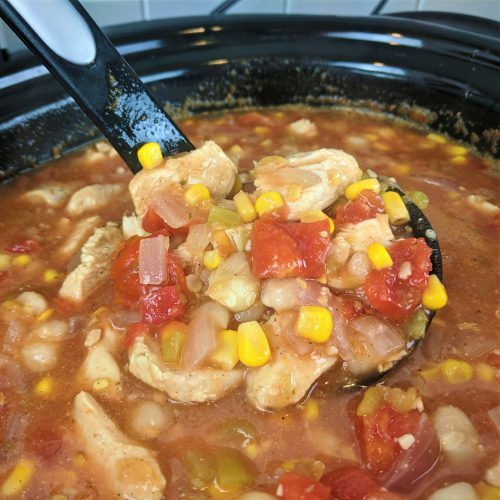 This Crock-Pot Chicken Corn Chili is bean free and deeeelicious! It is super easy to make and will satisfy the masses. It is perfect for those chilly days when you just want to hunker down by the fireplace with some warm food and a glass of wine. I suggest cooking the chicken in advance before putting it into the crock-pot. You can cook it any way that you choose. You can put it in the Instant Pot and shred it, throw it on the grill and cube, saute it or any method of your choosing! Heck, you can even use Rotisserie Chicken! 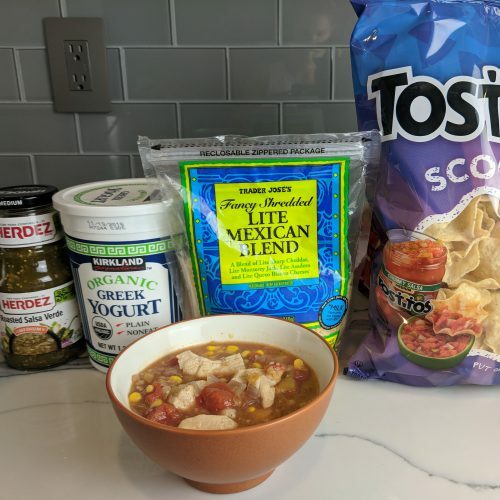 I top this chicken corn chili with salsa verde, lite Mexican shredded cheese and Greek yogurt. You might be thinking, Greek Yogurt?!?! Greek yogurt is a much healthier alternative for sour cream. Try it! I serve this with Tostito’s Scoops or Cornbread! Per ladel scoop this recipe has 161 calories, 17g carbs, 2.5g fat and 17g protein. I usually have about 2 ladel scoops per serving for a grand total of 322 calories, 34g carbs, 5g fat and 34g protein. These stats do NOT include the Tositito’s or cornbread. Hominy is a food made from kernels of corn. It looks like the wet version of corn nuts. Remember those?! You can find hominy right next to the canned corn. I usually buy mine at Walmart because you can’t always find it. 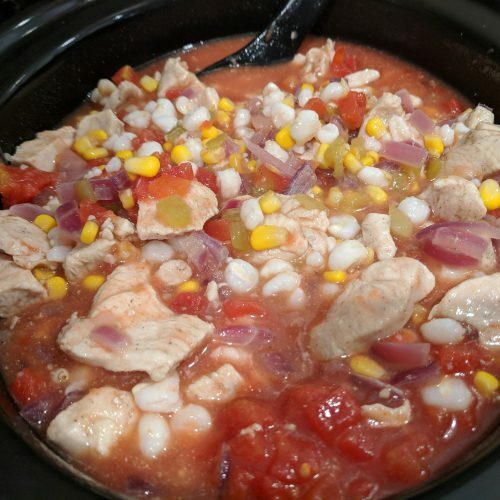 Because this recipe is filled with chicken tomatoes and corn, it is gluten-free! Just make sure that if you are gluten-free and want to serve it with cornbread you use a gluten-free cornbread mix (click here to view). 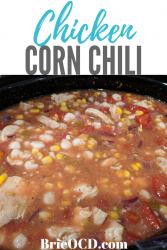 Hope you enjoy this chicken corn chili as much as we do!! 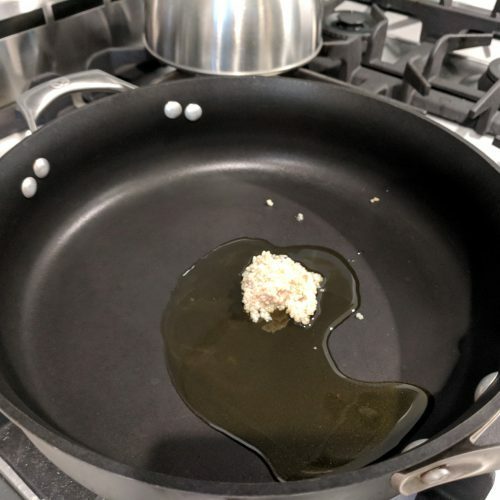 over medium-high heat, heat olive oil for 30 seconds. add garlic and heat for another 30 seconds. 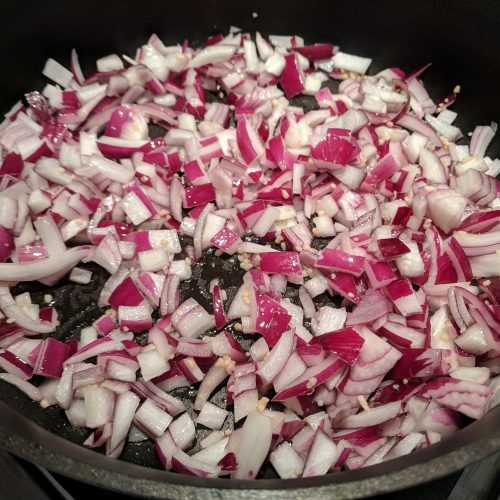 add onion to pan and saute for approximately 2 minutes. 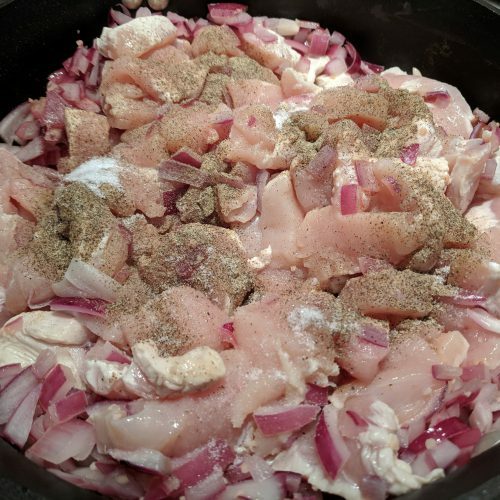 add to chicken, salt and pepper to pan and brown for 5 minutes, stirring occasionally. drain. 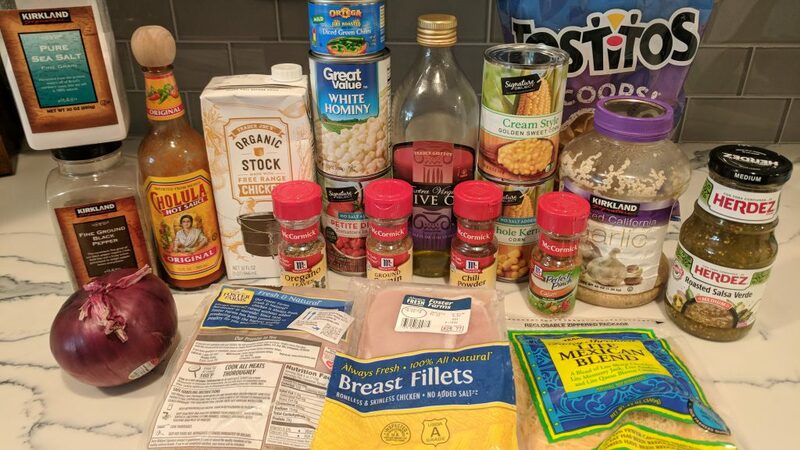 add all contents to crock-pot, including spices. Stir. set on low for 4 hours. add salt and pepper to taste. top with your healthy favorites! lite shredded cheese, greek yogurt and salsa verde! If you're feeling risque, serve with Tortilla scoops or cornbread!